I’ve misplaced my last tube (sadly, it was the Motives Lustrafy one too). I was bummed, but consoled myself by thinking I have to have another one buried in my makeup stash. Negative. I haven’t been out of mascara in a long time, so I made a pit stop at not-so-unfamiliar territory: Sephora (aka Shyema’s happy place). The problem is, even though you can try the mascaras there before you buy, I’m really particular about eye makeup. Plus, using their hygenic disposable ones doesn’t seem to give the real effect since so much of what makes a mascara good or bad are the brushes. SO, I visited their little mascara wall — for those of you who don’t know, they put their best mascaras on one shelf with a guide on the best for volume, lengthening, curling — or all three. I oogled the vibrating Estée Lauder Turbo Lash, which I’m equal parts curious and frightened over. I considered Benefit’s BadGal, but finally decided I’d give their own Sephora brand a go. They promised their Atomic Volume in Ultra Black ($16) “blows all other mascaras away” giving lashes major volume, length, AND is super dark, enhancing your eyes. I figured that sounded good enough and had an interesting bristled brush so I bought it. Ok, so now here’s something I don’t do all too often, and that’s telling you about a product that I turned out to be not super crazy over. I think I kinda channeled Tammy Faye Messner. That is, it kinda gave me too much volume (I felt like it was a lot of product sweeping out on my lashes) and they ended up looking sort of spidery and heavy. I also felt like it was a bit irritating to my sensitive eyes. Not a good sign. I can’t tell how ultra the black is because my lashes are already dark, so that’s not something I can fairly evaluate. Who it’s good for: If you’re looking for lots and lots of volume and separation. I like mascaras that are volumizing and clean but not super intense — something good for everyday that you can layer on for the evening. Sadly, this one just wasn’t my cup of tea. So yes, I’m still on the hunt for a new, fabulous mascara. I have my favorites, but I’m in the experimenting mood, so if you guys have any suggestions — drugstore or prestige — do share! I LOVE Estee Lauder’s Magniscopic. It makes my lashes look amazing. Also, believe it or not, Tarte has a great mascara (it comes in a purple leather casing). When I run out, I reach for the original Voluminous because it doesn’t clump and it gives great volume and length. Let us know what you settle on!! i hear good things about Maybelline Full n Soft actually! And I’m a bit curious about L’Oreal Telescopic — anyone try that one?? missy, l’Oreal voluminous is my go to also!! they make great mascaras. I’ve been using Diorshow for the longest time, but I really want to try Fiberwig (sold at sephora for like 24 bucks or something). Have you tried it already? my current favorite is maybelline colossal. 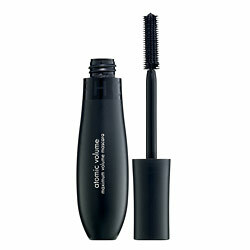 it separates the lashes, has buildable volume and has a nice glossy finish. when it comes to mascaras, i definitely favor drugstore brands over prestige ones. rimmel volumexpress & rimmel lycra lash are real good too. badgal!!! so bada$$. badgal blue is actually one of my absolute favorites. i also recently tried smashbox’s mascara in this fun plum/maroon color. not so pretty when you wash your face (looks like your eyes are bleeding), but gives a cool look. sephora lets you return stuff even if you used it right? what are your thoughts on these new vibrating mascaras? maybelline and l’oreal make the best mascaras, i feel. everyone raves about maybelline great lash and it is all that but it’s also a bit greasy and tends to smudge. there’s a l’oreal one with collagen that eva longoria has been promoting. that’s going to be my next try! Shiny, I like DiorShow (just ran out of that too!) but the brush is huge! I seriously poked my eye at least three time, so yes, not for the less adroit. I’ve tried fiberwig, it’s not bad actually — it’s weird when you wash it off because it comes off in pieces instead of smearing away! Colossal sounds tempting, and badGal I know is also good, but same issue with the brush for me! I like YSL. I don’t curl my lashes and I’m horrible at applying mascara, but YSL mascara I can actually apply without getting all clumpy. My personal makeup theory is that if you’re makeup-smart, you can use store brands, but if you’re makeup-challenged (like me! ), you do better with the pricey stuff. I still stick the wand directly in my eye 50 percent of the time (which hurts no matter how much you paid, surprise surprise). aww Amélie I wish I read this earlier because I was actually REALLY curious about the YSL one but haven’t heard anything about it, so I ended up not getting it. I agree with your theory though — I really think drugstore brands are awesome and it’s just a matter of being able to pick out the good ones since you can’t…sniff…try before you go. I totally love badgal blue too! And since I don’t use mascara all that much, its great for when I actually feel like wearing because its got more pizzaz than normal mascara! i was just at sephora last night and was frustrated about the same thing! once again i wanted to try on a mascara but theres no point bc of the tester brushes..i really like estee lauder’s magnascopic, mainly bc it washes off with just water and face wash..my eyes are sensitive too and its been great so far…ive been wondering about the vibrating brush one also! havent tried it though bc i would definetly poke my eye ..i already do with the regular brush all the time..anways hope you found something you liked :)! volume is important…this might be a good option. it’s btr than fake lashes! l’oreal double extend. and i love love love that it washes off with just water. i love it.